Don't limit yourself to just 15 or 30 amps when connecting your RV's 50A power cord to a power panel. The Power Maximizer combines the power from a 15A and 30A outlet allowing your RV to receive up to 45 Amps! Combines power from a 15 Amp Male and 30 Amp Male to give you up to 45 Amps (Female). 30A side: 30" and 15A side: 36"
15A Male is Nema 5-15P and 125 V / 1875 Watts. 30A Male is Nema TT-30P and 125 V / 3750 Watts. 50A Female is Nema 14-50R and 125 V / 5625 Wattss. 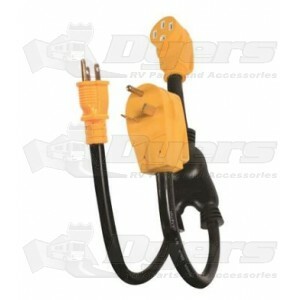 Camco RV Power Grip Maximizer Adapter gets up to 45 AMPs combined power. It draws the combined power from a 15 and 30 AMP outlet, which allows the RV to receive up to 45 AMPs. This maximizer does not work when plugged into GFI type outlets. It is a polarized adapter designed solely for recreational vehicles and is not for use with any other adapter or device. This maximizer adapter must be used in conjunction with properly sized circuit breakers. Awesome Part, works great, fast shipping!